History and Culture – In 2309, explorer Jennifer Chew discovered the Jennifer Asteroid Belt 15AU from a dead star. Both a rich source of ores and an ideal way-stop between the Sol-system core and the settlement on Emory, a number of mining and freighting corporations constructed a city-sized space station on Nerion Asteroid. Over time Nerion Station has enlarged but not evolved. It is utilitarian, serving the needs of the Jennifer Belt miners, and commercial transportation. It is governed by the twelve mining companies that lay claim the the Jennifer Belt, and a myriad of hospitality and services businesses, both chartered and private. The culture is rough and risky, and corporate-run. 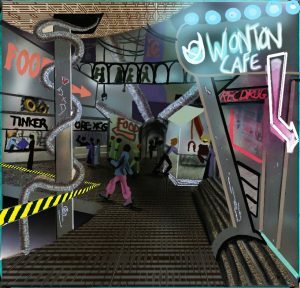 Like many industrial-classed worlds, largely ignored by the government, Nerion Station has a vast underbelly and is a favorite meet-point for black marketeers with corporate connections. Mining life is so risky workers sign a mortality clause stating no medical attention will be dispatched to the Belt, and no law suits can result from injuries sustained on the job.